Otrum is the segment leader in functionality, stability and ease of use. With Smart TV implementations investment costs can be significantly reduced using existing infrastructure such as coax, Ethernet and Wi-Fi. This flexibility also includes hybrid solutions with mixed infrastructure. Built on a HTML5 foundation, Otrum software works across multiple platforms and delivers a seamless user experience across TVs, tablets and smart phones. Powerful tools are provided for branding and customisation, including graphical languages such as Arabic and Russian. Netflix, HBO, iTunes, Youtube and more – all of your guests favourite content displayed securely. Your guests arrive at the hotel with their own smart devices and their own catalogue of content. 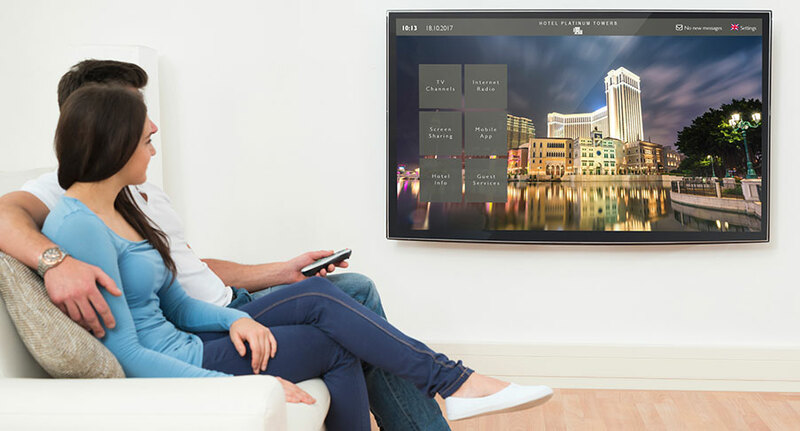 Otrum Enterprise enables the guest to easily view their content on the large in-room screen. Intuitive onscreen instructions guide the guest from start to finish. For security purposes, Otrum utilises secure authentication between the smart device and the TV, this ensures that content is only shown on the desired screen. Optimise room management and achieve operational excellence. Smart tools for smart hotels. Turn your guest rooms around more efficiently, only occupied rooms generate revenue. 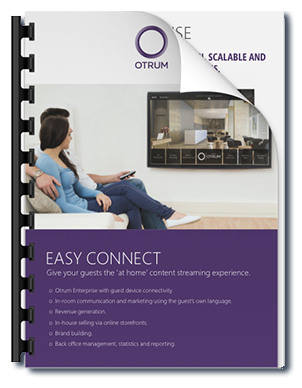 Otrum Enterprise provides housekeepers with access to dedicated tools from any connected device or in-room TV. Room status is reported to the PMS immediately, with cleaned and vacant rooms available for immediate resale. Revenue generation has never been easier. Unlimited sales opportunities through TV and mobile. Enabling purchases, bookings and orders of any services that you would like to offer your guests. Depending on your property, needs and service level you can let your guests browse and book services such as spa treatments, a table in your restaurant, tee off time at the golf course, baby sitter or perhaps order a late check out. Cut costs by aligning services with guest needs. Fact based decision making. The statistics application provides insight into how your guests are using the interactive solutions within your hotel. Detailed information allows you to learn more about how your guests are using the system, and enables you to more effectively use all the tools that Otrum provides. Revenue generation has never been easier. Unlimited sales opportunities through TV and mobile.